Hello ... Hello ... my old friends ... It's great to see you once again! When John Lennon stated that ELO were the "son of [The] Beatles" back in 1974, it was the ultimate of compliments and another huge nod to the influence of The Beatles on Birmingham's finest. 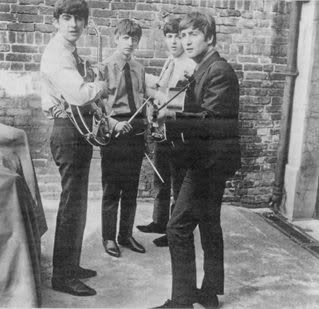 The Beatles' played their maiden live performance in Birmingham back on Friday 15th February 1963 - the first of three appearances at King's Heath Ritz Ballroom in the very home of 'Brum Beat' - and 2017 sees their historic Brum debut being commemorated with a very special event. My good friends Bob Prew and Ken Whittaker at King's Heath Walk Of Fame contacted Yours Truly KJS at elobeatlesforever (elobf) recently to highlight their forthcoming Beatles All You Need Is Love Fest on Sunday 12th February. The three hour event - starting at 3:00PM - will see a plethora of local musicians performing Beatles love songs (including elobf featured artiste Alex Vann) at Fletcher's Bar in York Road, King's Heath. Advance tickets priced at £4.00 each (*plus booking fee) can be purchased from Kitchen Garden Cafe and wegottickets.com with tickets on the door priced at £5.00 each (if available). 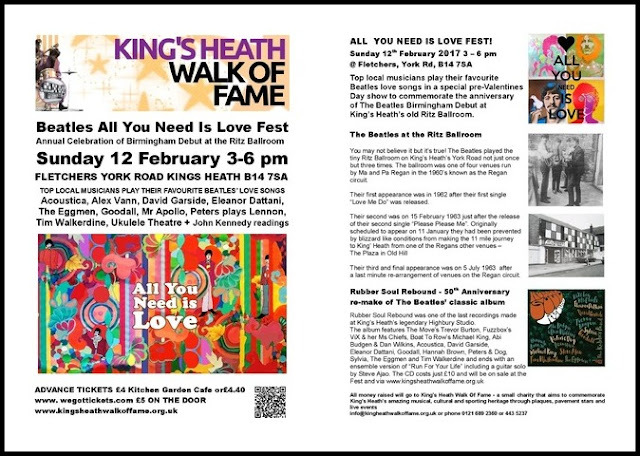 elobeatlesforever (elobf) recommends King's Heath Walk Of Fame Beatles Fest 2017 to those enlightened folks who enjoy the music of ELO, Jeff Lynne, Roy Wood, The Move, The Idle Race, 'Brum Beat', The Beatles and related artistes.